What Is The Cribari Grid? 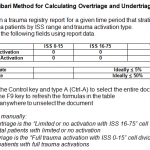 I’ve spent some time discussing undertriage and overtriage. I frequently get questions on the “Cribari grid” or “Cribari method” for calculating these numbers. Dr. Cribari is currently the chair of the Verification Review Subcommittee of the ACS Committee on Trauma. He developed a table-format grid that simplifies calculation of these numbers. I’ve simplified the process even more and provided a Word document that automates the task for you. Just fill in four numbers in the table, update the formulas and voila, you’ve got your numbers! Instructions for manual calculation are also included. Click this link or the image above to download the file.